Posted on November 6, 2018 at 11:00 am. Business Email Compromise Scams (BEC) are hitting financial institutions hard, and the threat only seems to be increasing. CEOs, CFOs, and financial employees are at a high risk of being targeted in BEC schemes, regardless of company size. Whether a small, community credit union or a multi-million dollar financial institution, these targeted schemes are impacting the bottom line for businesses across the globe – and here is what they all have in common: the targeted business must work with foreign suppliers and/or utilize wire transfer payments regularly. 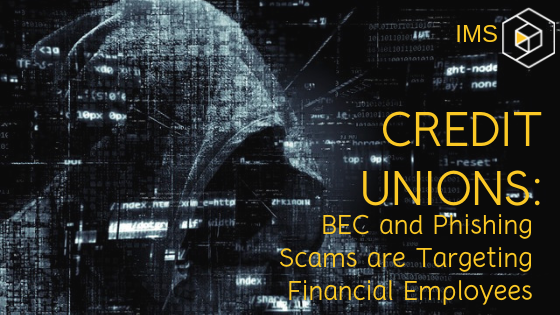 Also known as CEO fraud, and more generically phishing, a BEC scam isn’t carried out until the attacker(s) have done their research, ensuring a more favorable outcome. The criminals first choose a business to target and will then do online research via social media channels to locate the exact, accurate names of the CEO and CFO, finally targeting an employee — usually one that works in the finance department, company attorney, long-time company vendor, or client — to carry out the attack against. Once a target has been selected, the criminals then send fraudulent email correspondence usually impersonating the CEO or CFO of the target company, attempting to fool the victim into initiating a wire transfer. If successful, the BEC attack will result in gaining access to the target’s business systems and records, including employee credentials, and the possibility of an enormous financial loss for the target company. How Can these Scams be Effective? Giving the idea that that the sender of the email is using a mobile device to create and send the email, by including the signature “Sent from my iPad”, instead of the standard corporate email signature. This is one of the most effective methods, as the normal “red flags” (typos, poor grammar, lack of corporate signature), because mobile devices are often “excused” from triggering them. There has been a 270 percent increase in exposed losses and identified victims of BEC scams since January 2015.
provide employees with proper, accurate and thorough training about targeted cybercrime, and ways to validate the legitimacy of correspondence. require careful monitoring of email addresses, to help avoid spoofing attempts. utilize two-factor or multi-level authentication procedures for every wire transfer, regardless of situation or circumstance. At IMS, we sincerely care about the protection and privacy of your data, employees, and members. We work with credit unions nationwide, to assist in minimizing risks and maintaining the safety of your data. If you would like to discuss how we can help protect you against financial cybercrime, contact us today or complete the form below!